"A study that is exhaustive, richly documented, finely articulated, and extraordinarily broad in the range of knowledge and literary examples that it brings to bear." -Donald Freeman, Poetics Today. Go to full review. "This is a truly interdisciplinary book, a book of importance both to literary scholars and to scientists of the mind - linguists, psychologists, anthropologists, and researchers in artificial intelligence. It shows that the study of the literary mind is an integral part of the study of the mind in general. And it shows clearly that everyday language and literary language are not separate domains, that discoveries about one bear on the other." "Turner's book lives up to its colorful and ambitious title: it is not just another book of theory about metaphor, it is a book of linguistic and critical theory deeply immersed in particular metaphors and their effects. To me it offers more sheer pleasure than any other book on metaphor, and the fun pays off with rich new insights." 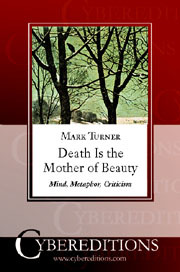 Other comments on Death is the Mother of Beauty, by Alan Richardson in his review of The Literary Mind.